Exciting news! 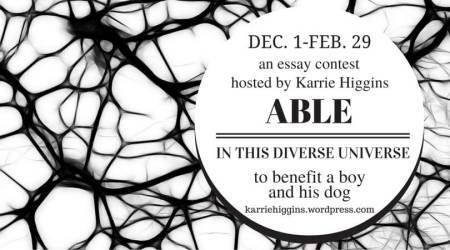 The Able in this Diverse Universe Essay Contest is now open for submissions! All submissions fees benefit the training and care of Noah Ainslie’s future Autism service dog, Appa. Also exciting? One of our readers is none other than Dr. Kwame Brown. The contest not only will help Noah, but it will also raise awareness about invisible disability and ableism, two issues near and dear to my heart (and many of my readers’ hearts). Aw, what a sweet photo! Noah looks so happy. 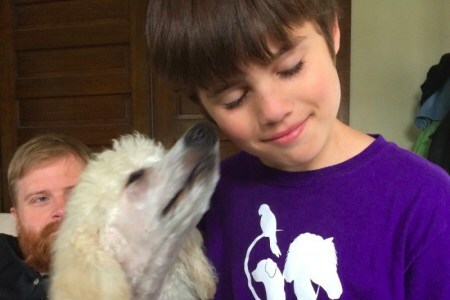 Noah’s neurodiversity often manifests as sensory overwhelm. He has been learning coping mechanisms for six years, but still visibly struggles when it comes to conforming to neurotypical standards. He is high function on the spectrum which means he doesn’t “look like” he’s disabled. He is subjected to ableist expectations, often very aggressively and in public. Friends, the Able in This Diverse Universe essay competition has an amazing panel. We have four judges all of whom have knowledge of/experience in disabilities and/or neurodivergence. All reflections on disabilities, visible or invisible are most welcome. Read on to see who will review your work.